The Lagavulin Experience is a groundbreaking shared VR experience that takes people on a multi-sensory distillery tour of the famous Scottish whisky, Lagavulin. We worked with our long term collaborators multi-sensory specialists Condiment Junkie and global drinks agency Diageo to create a fully immersive experience with 360° video, smells, tastes and sounds. The Lagavulin Experience launched with an invite only event at the Oval Space in Hackney, London. The delivery was twofold. First of all we created a video-dome experience where 20 people step into a 10ft video Igloo dome and into the full multi-sensory shared virtual world of the distillery on the Isle of Islay. The video was projected at the ultra high resolution of 8K with surround sound playing from the integrated 5.1 audio system. Items like pieces of peat and grains of barley were given to the people to touch and smell as if they were actually in the peat field and barley field. The video above illustrates exactly how this played out, when the experience launched at the Oval Space in Hackney, London. 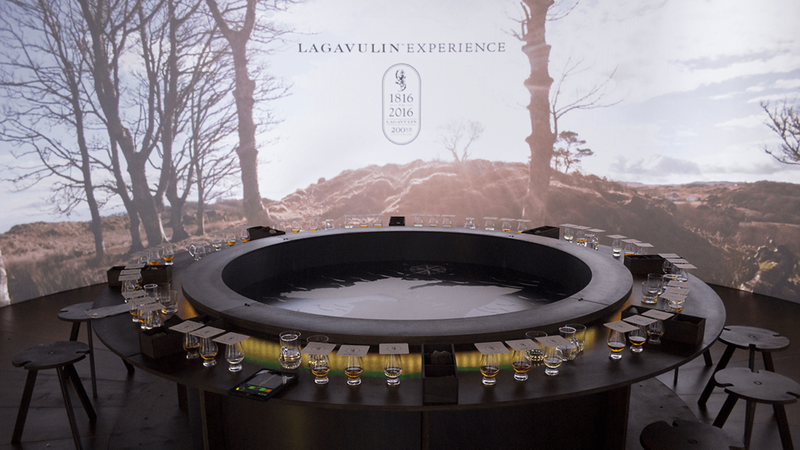 The Lagavulin Experience was made available on YouTube 360° with specially commissioned Google Cardboards. Subsequently we delivered a 360° video complete with spatial soundscapes and atmospheres to give the customer the ultimate home drinking experience. As a result we delivered content which lives on and on in many homes. Above all, filming on the remote island of Islay was an incredible experience. We captured the whisky making process from the grain to the glass. We filmed in the barley fields, the peat fields, and the 200 year old distillery itself. Each shot was lovingly composed and as a result gave the viewer an experience as close to a real distillery tour as possible. The dome travelled around the world. It visited events from the East coast of America to Japan. But if you missed that you can see the Google Cardboard version below. Finally, you can also see the Lagavulin Experience on our app, which can be downloaded here.